Mother Melania will look at fasting, almsgiving, and prayer in the broader context of the three basic temptations in Eden (the fruit was good to eat, pleasant to the eyes, and desired to make one wise) and how Christ conquered those temptations in the wilderness when tempted by the devil, and how we must do as He did. 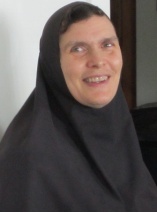 About the Speaker: Mother Melania is the abbess of the community of Holy Assumption Monastery in Calistoga, California. She has written several series of children’s books (The Twelve Great Feasts for Children; The Three-Day Pascha; the Old Testament Stories for Children series; and the Good Neighbors series – a series of animal fables designed to teach children Christian virtue in an engaging way). Mother Melania has made a particular study of St. John Chrysostom’s writings. Because he was writing not only to monks but to people living in the world, he has much practical advice to offer for today’s Christian. A $20 contribution is requested. Luncheon will be provided. Registration due by February 9th, 2019.
or Susan: susansophia.f@gmail.com for more information. Driving directions to Holy Resurrection can be found here. Please fill out the registration form and mail to PO Box 1332 Puyallup, WA 98371 by February 9th. Thank you.